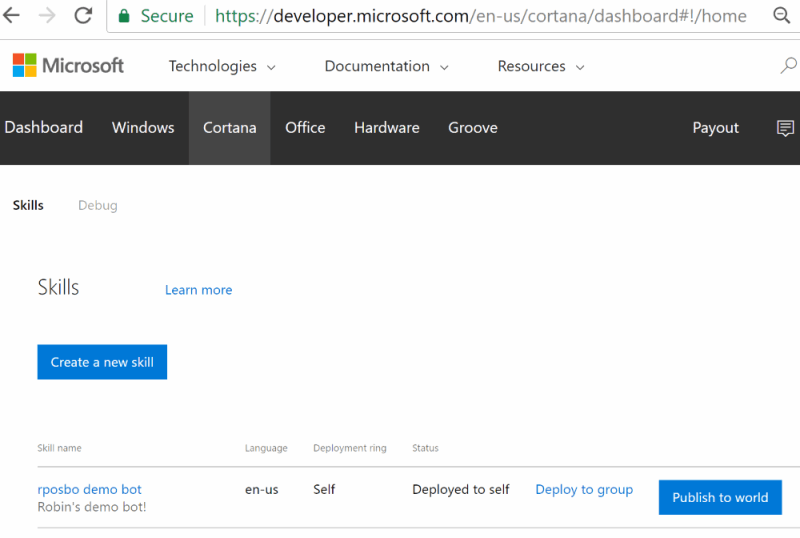 At //BUILD 2017 Microsoft announced support for Cortana Skills and connecting a Cortana Skill into a Bot Framework chatbot; given the number of chatbots out there using Microsoft Bot Framework, this is an extremely exciting move. 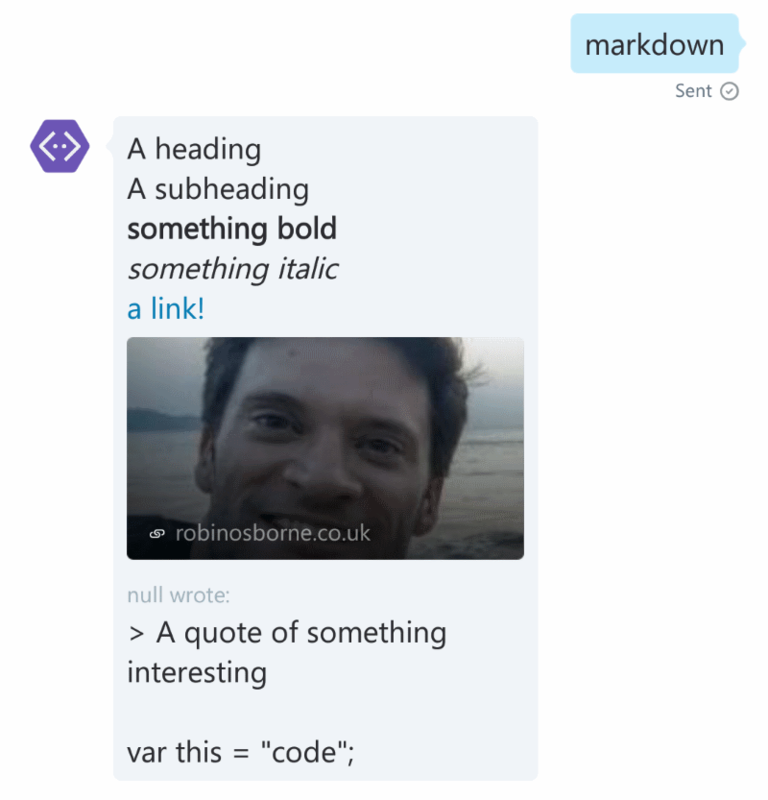 In this article I’ll show you how to create your first Cortana Skill from a Bot Framework chatbot and make it talk! 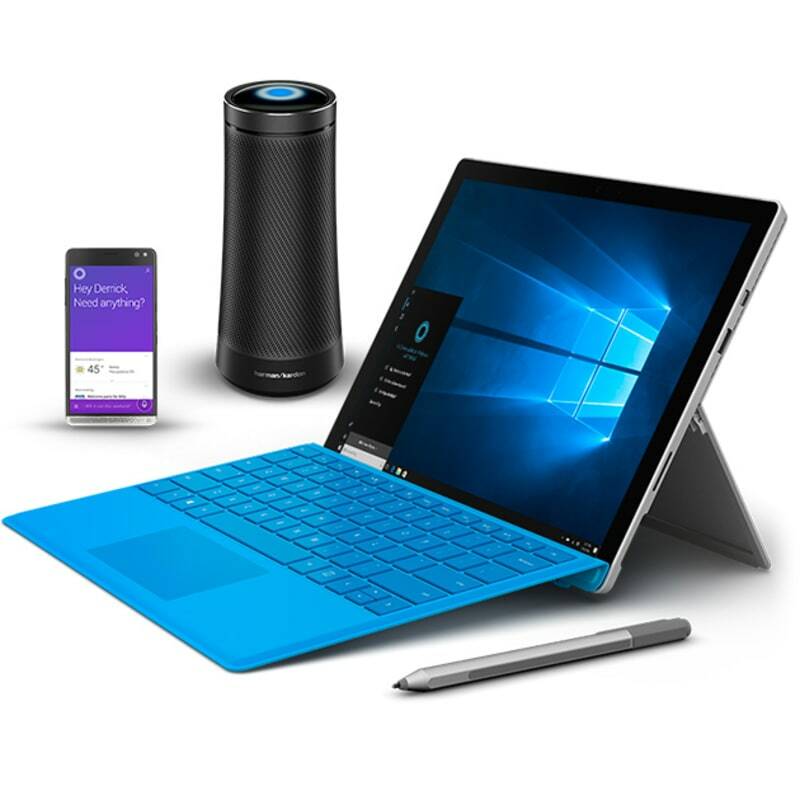 If you’re not already familiar with Cortana, this is Microsoft’s “personal assistant” and is available on Windows 10 (version 1607 and above) and a couple of Windows phones (Lumia 950/950 XL), a standalone speaker – like an Amazon Echo – and a plethora of devices that can run the Cortana app, including iOS and Android and plenty of laptops. You’re going to be seeing a lot more of this little box of tricks (“Bot” of tricks? Box of bots?.. hmm…), so you might as well get in on the act right now! 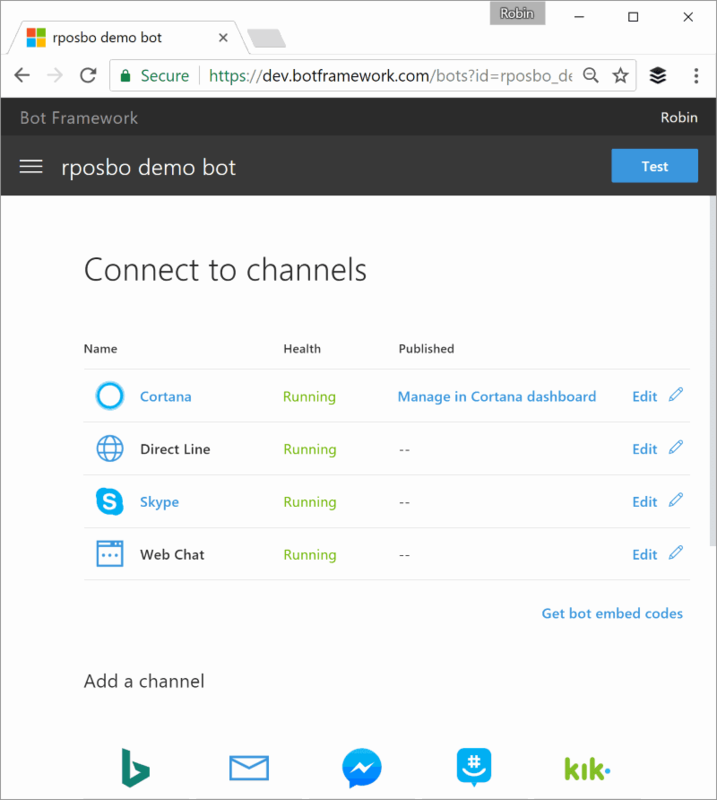 Create your first botframework bot in Azure! 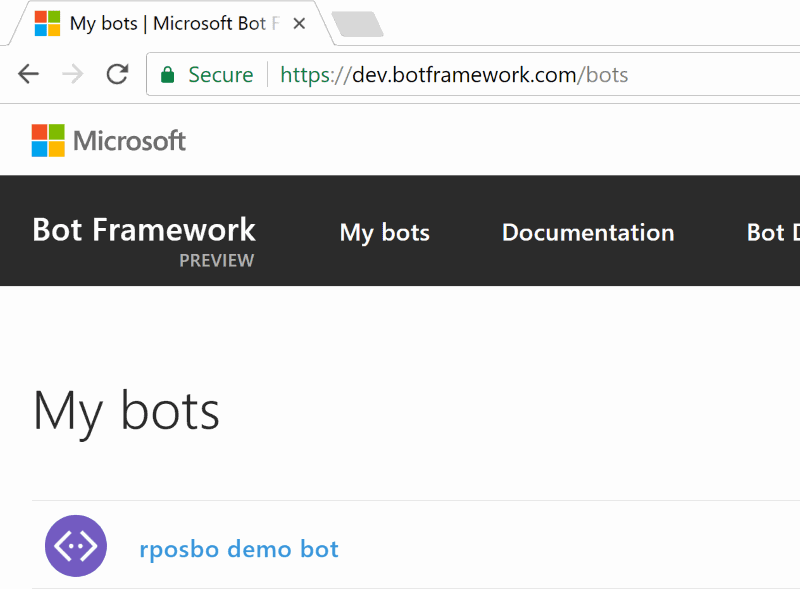 The first thing we’ll do is head over to the Bot Framework developer centre at dev.botframework.com. 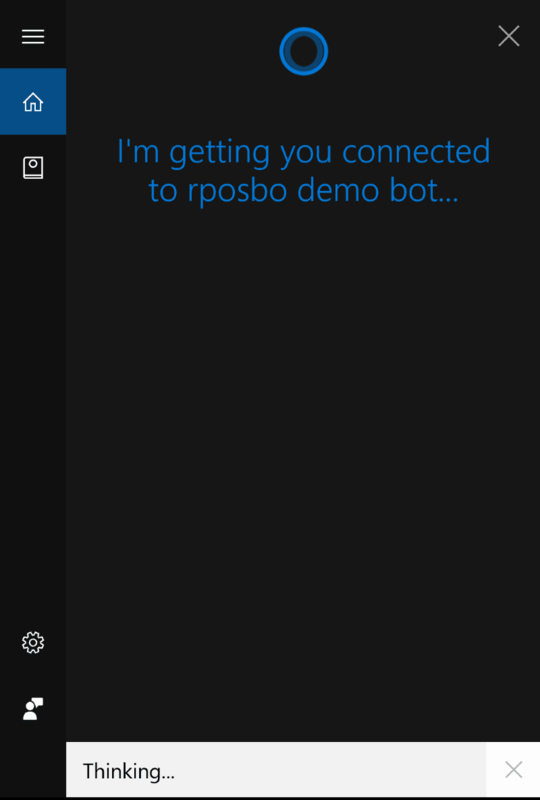 Log in, and choose the bot you want to power up with Cortana awesomeness! This is what you’ll have to say in order to get Cortana to invoke your skill. Don’t make this something hard to say or hard to understand etc etc. I’ve gone for “demo bot”. If you’re already an American, then by now you should have achieved the bare minimum necessary to have your Bot Framework chatbot accessible through Cortana. If, like me, you’re not so fortunate, then you need to pretend a bit. Cortana is currently limited to the en-US locale, so you may need to configure your pc to be U.S. friendly. From here you’ll need to change your Region to “United States”, tap “Add a language” and search for “en-us” to add “English (United States)”. You’ll need to restart and let your machine download the various updates and language packs necessary. 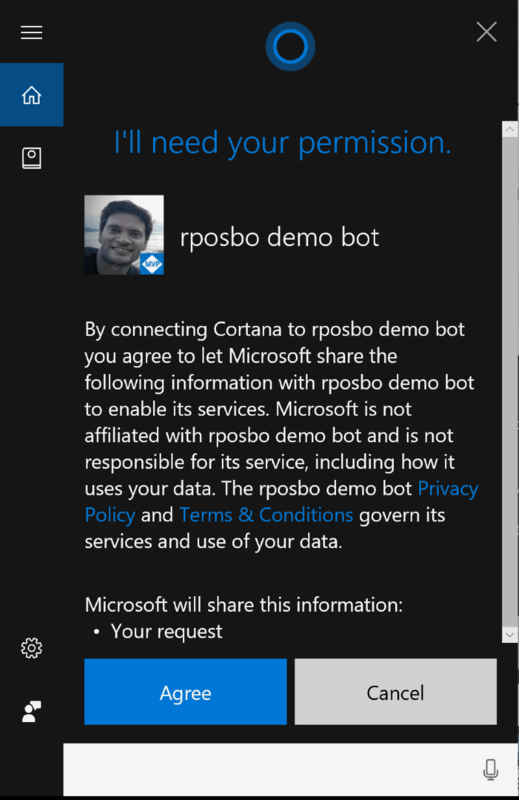 Ok, now you should have done the bare minimum necessary to connect your bot to Cortana (at least for you). Make sure you’re logged in to your pc using the same account that you use for your Bot Framework/Cortana dashboard configuration, otherwise your Cortana app won’t be able to find your skill. Give it a go! 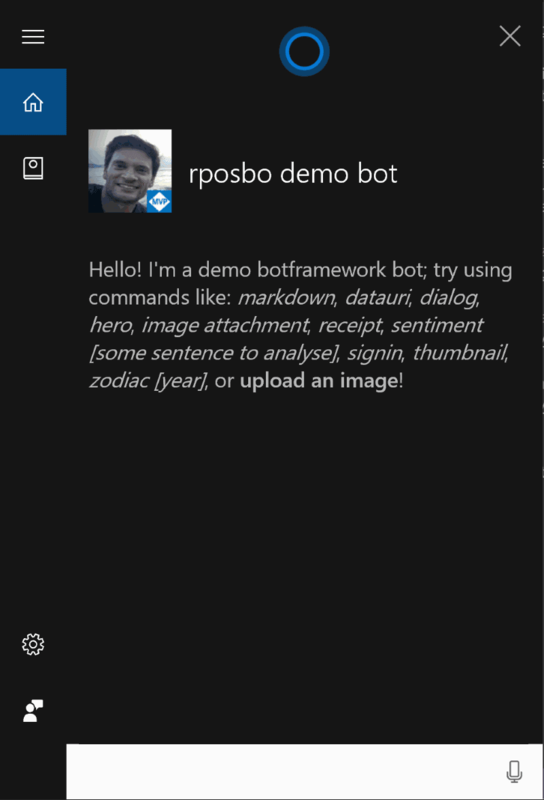 In my case (because the invocation name for my bot is “demo bot”) I just say “Hey Cortana; ask demo bot hi”. Yeah, I know the structure doesn’t make sense, but Cortana seems to need you to say “ask” otherwise it thinks you’re sending a message to someone if you say “tell”. Since I didn’t request any extra information from the user, the permission is just for “your request”, i.e. “hi”. I’m ok with that, so I’ll tap “Agree”. 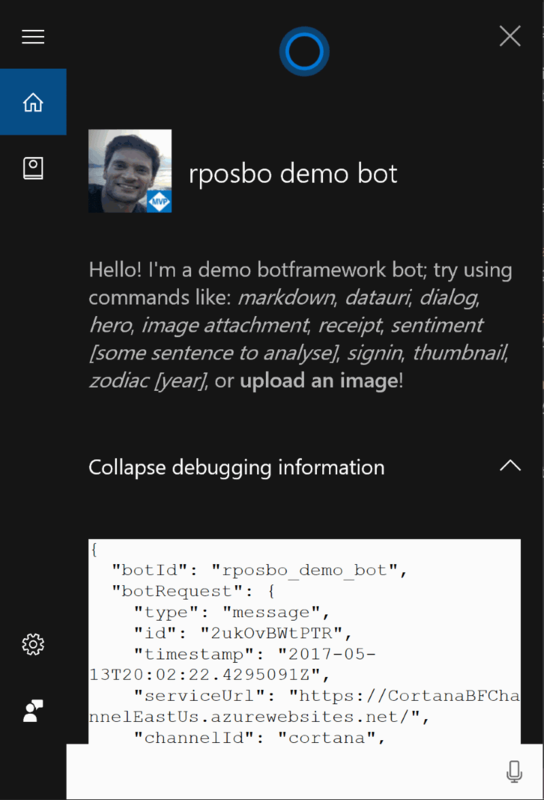 Without much effort, we’ve taken an existing Bot Framework chatbot and exposed it via the Cortana channel. But it’s mute; no voice. Before we make it talk, let’s investigate the Cortana dashboard a bit. We already have some interesting info here; Deployed to self and Deploy to group. Right now, the only person who can use your skill is you; more specifically, the same Microsoft sign in account that your bot belongs to. In order to use your skill with Cortana, you must be logged in to Cortana using the same account. If you want to share this skill with someone else, you can just tap “Deploy to group”, add in their Microsoft sign in email address, and you’ll be given a URL to send them which will give them access to your skill! Cool, huh? Here I’m sharing the skill with .. um.. me! Ooh! I haz access too! Great for testing with a specific group of people. That way, you can cater your bot response to be more audio based instead of visual, or vice versa. What does your bot sound like? Lastly, let’s make a couple of tiny changes to give our bot a voice. Right now you can talk to your bot, but you won’t hear anything in the response. Let’s fix that. 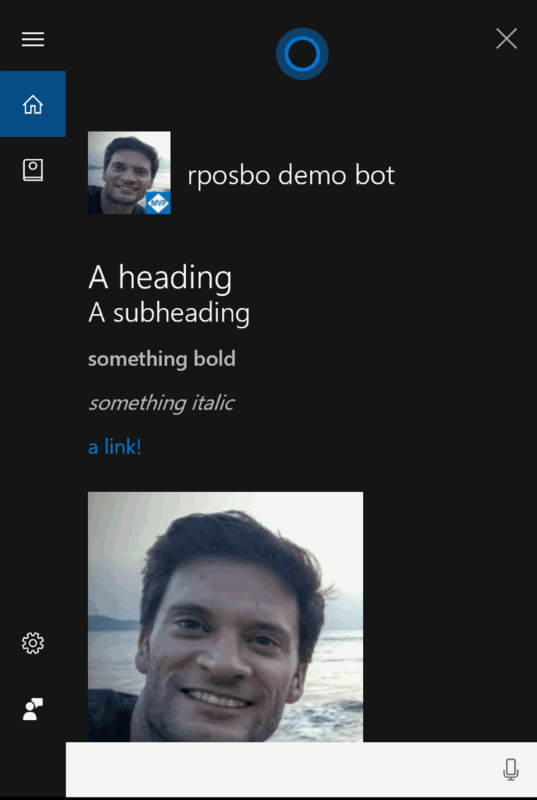 Go through your existing chatbot and add in a few Speech properties to the reponse, redeploy, and ask Cortana again; suddenly your bot will be able to speak! BOT EVOLUTION! Aw yeah! 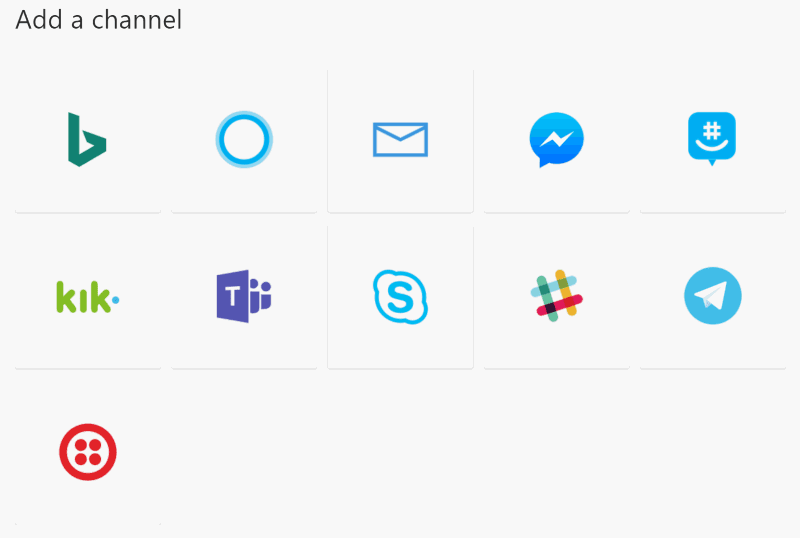 In this article I’ve shown you how to connect your Bot Framework chatbot to the Cortana channel, how to set up your PC to set up Cortana and connect back to your bot, and how to give your bot a voice. There’s still so much cool stuff to share, so stay tuned for more Cortana articles! ← Involved in a startup? Read this! using your example above, how can you give the response and end the conversation? is there a method to add the end conversation to the public static class MessageActivityExtension ? I am facing a strange issue, Cortana app in Android phone invoking my bot perfectly fine but the same is not working in Windows 10 laptop though I have logged in using the same Microsoft Id that I used to develop the bot and also laptop region and language set to United States and English(United States). Image Placeholders: Do it right or don’t do it at all. Please.